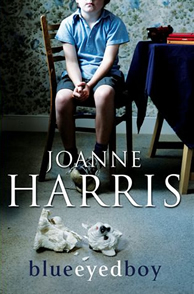 This was one of the stranger Joanne Harris books… along the lines of Sleep Pale Sister. The book developes throughout web postings on “Badguysrock” focussing on a couple main characters’ postings… and it really pulls the people can be anyone on the web and most likely not who they actually are. BlueEyedBoy is one of the main characters and you travel back and forth in time with him in combination of truth and fiction – restricted and full access posts as he plots the murder of his mother and others who have made his life miserable.